In 1899, the Wisconsin Trapshooting Association was organized. Its purpose was to hold the Wisconsin State Shoot and support the sport of trapshooting. The Wisconsin State Shoot was held at various shooting clubs throughout the state for the first 49 years. In 1948, the State Shoot was moved to the Waukesha Gun Club. For the next 64 years, the Wisconsin State Shoot has been held at the Waukesha Gun Club. However, 2013 began a new era for the WTA. For the first time, the Wisconsin State Shoot was held at the official home of the Wisconsin Trapshooting Association. The new Shooting Complex and Learning Center opened on the first day of the 2013 State Shoot, July 16. The WTA also maintains a special list for shooters who have demonstrated a unique skill level. The award level are AA-27-AA and AAA-27-AAA. Congratulations to all the listed shooters. John Atkielski has provided a copy of the 1974 Wisconsin State Shoot Program. Thank you John!. Look at the cost of shooting and options. Where did they go? Gordon Horigan has provided a copy of the Sportsmen’s Review from April 10, 1948. Sportsmen’s Review was the official publication of the ATA. Today it is Trap and Field. Please take some time to view the historic photographs and information. Thank you, Gordon, for providing this look back in time. Gordon Horigan also provided a 1937 issue of Shooting Holidays for your review. Thank you again Gordon! 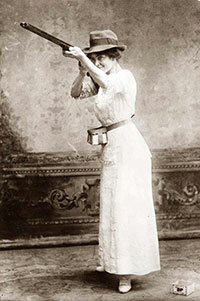 In 1914, the results from the Wisconsin State Shoot were published in Sporting Life. The scores and names start near the bottom of the 2nd column. You may have to zoom in to 200% to read the names.